InsertLearning provides teachers with an easy way to transform web pages into interactive lessons. It can be used in any subject and at any age, from having emerging readers highlight words they recognize in text, to students documenting progress by recording themselves reading aloud, to annotation, collaboration, and critical analysis of content. 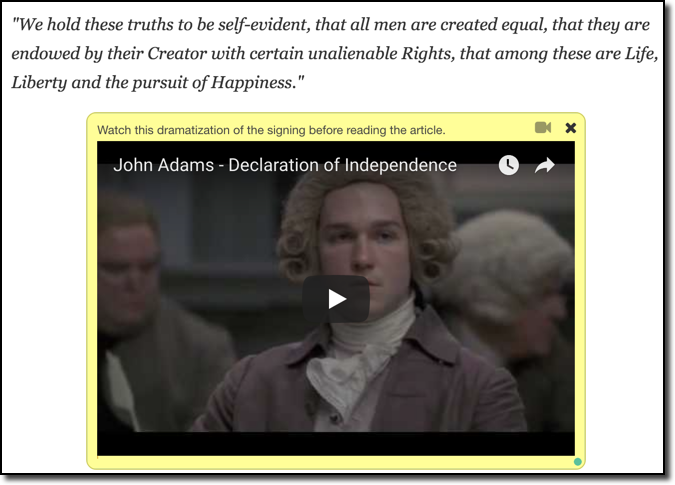 Teachers can use their Chrome extension to insert annotations, questions, discussions, pictures, video, and other interactive content to any web page. 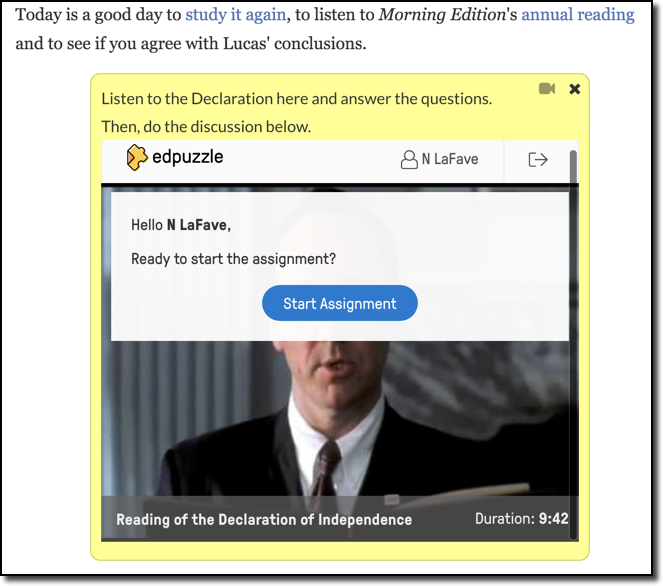 InsertLearning has been designed with convenient integrations and features that make it easy to create classes and assignments, and view and grade students responses. You can create 5 lessons for an unlimited number of students for free. Unlimited lessons are available with paid plans that start at $40/month. You’ll need to use Google Chrome as your browser, and install the InsertLearning extension. You can install the extension by clicking “Add to Chrome” at the top of the InserLearning page, or through the Chrome Web Store. You’ll be prompted to log in to the extension after installation. Be sure to use your school Google account. You can create classes using Google Classroom, you LMS (Canvas, Schoology, Edmodo), or simply within InsertLearning itself. Any of these options make it simple for students to access their lessons. 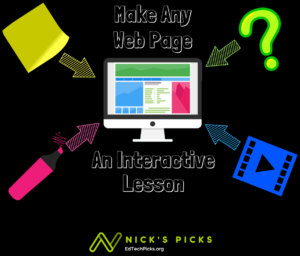 Once you have found a web page that you would like to feature in your lesson, it’s time to insert some additional instructional elements. Click the sticky note icon in the Insert Learning sidebar. Select the paragraph to insert your sticky note under. Add text to your sticky note (you can also paste content like images and links to other sites). Paste the embed code from a YouTube video into a sticky note so that students can watch the video without leaving the page. You can do the same thing with nearly any content that will give you an embed code. I love the idea of embedding EdPuzzle video lessons, complete with questions. Make sure you check out this list of more than 60 tools that you can embed with InsertLearning. Click on the pencil icon in the Insert Learning sidebar. Select the text you wish to highlight. Optional: Click the + icon beside your highlight to add a comment. You can also change the color of the highlight by clicking on the paintbrush icon beside your highlight. The example below highlights the word grievances with a comment added to define it. Click the ? icon in the Insert Learning sidebar. Select the paragraph to insert your question under. Type your question you can also adjust point values for each question). Simply type some choices to turn any question into a self-grading multiple-choice question (perfect for formative assessment). Click the speech bubbles in the Insert Learning sidebar. Select the paragraph to insert your discussion under. Multiple choice questions are graded for you. Discussions are not graded. Grading other questions is simple, and features some convenient ways to review student answers. Click on “Grades” at the top of the dashboard on InsertLearning.com. Select the class and assignment you wish to grade, then decide how you would like to grade it. 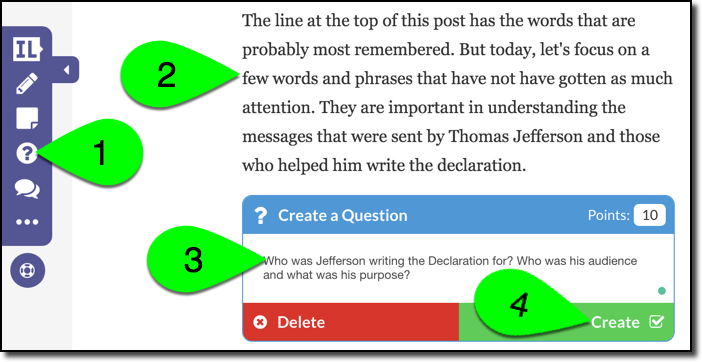 You can grade by student to view all of a student’s responses for the assignment. 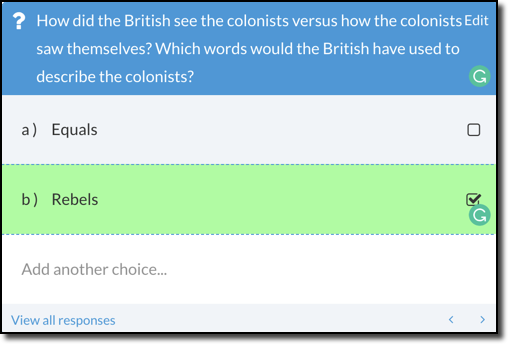 My favorite option is the ability to grade by questions, where you view every student’s answer to an individual question. The Resources tab of the dashboard has a number of helpful resources. The advice, tips, directions, and resources in the Help Center are very well-written. Check out Examples to preview a variety of lessons, or experience them as a student. You can also copy lessons from the Examples page, or visit the Public Library for access to teacher-created lessons for practically any subject.